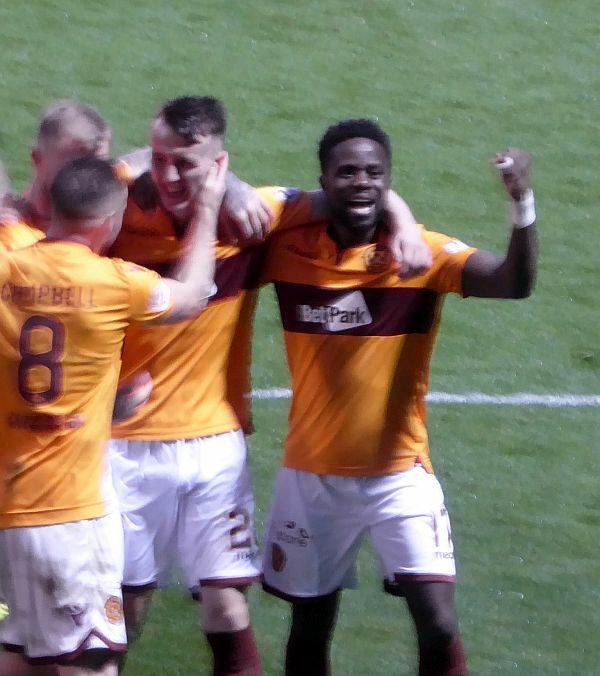 Motherwell produced an excellent performance to secure three wins in four as they dismissed Aberdeen 3-0 at Fir Park. A double from Danny Johnson and a goal from David Turnbull sent us home happy. There was much to be pleased about for those in the home stands. Our much altered team was well organised and full of positive intent from the outset. Gillespie gave a confident display in goal and Mbulu fitted in seamlessly into the back three. There was action at either end inside the opening minutes with Johnson trying his luck from long range before McGinn tested Gillespie. Shinnie gave our ‘keeper another examination after 20 minutes but the ball was held. We opened the scoring in 25 minutes when Johnson pounced on a slack ball from McGinn. He engaged in a chase with Logan and the paired flew from the halfway line into the Aberdeen area. Grimshaw was on hand but Johnson’s low drive left him a happy spectator. The second followed five minutes later. Bigirimana curled a 25 yard free kick around the wall and Lewis was happy to concede a corner. The defence gave Johnson some room and he headed us into a comfortable lead. There was more to come. Aberdeen made a half time substitution changing Wilson for Cosgrove but it made no difference to the flow of the game. Ten minutes in and Turnbull pounced of a wee deflection. His low drive flew into the corner to complete a brilliant victory. Main covered miles and he formed a good partnership with Johnson. Every player contributed and earned our applause. Let’s hope the momentum continues at Livingston next week.